The laptop computer is one of our greatest mobile productivity tools, and at the same time, a fantastic way to procrastinate with endless distractions at your fingertips. For those times when you’re racing a deadline, and can’t trust yourself with easy access to Facebook, King Jim’s new Pomera e-ink typewriter strips away all those distractions forcing you to just write—but it’s no laptop replacement. Forces you to focus on writing. E-ink screen works great outdoors. You'll need to navigate a Japanese keyboard layout, and master keyboard shortcuts again. Although relatively unknown here in North America, King Jim is a popular office supply brand in Japan, known for its desk-friendly gadgets like digital rolodexes, scanners, and label makers. 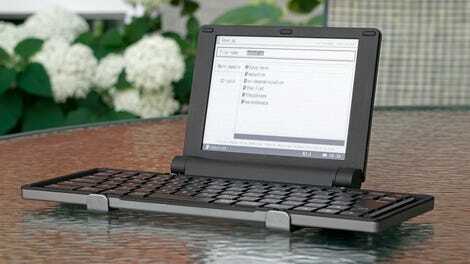 Ten years ago it released the Pomera (Digital Memo) DM10, a paperless digital typewriter that paired a simple monochrome LCD display with a laptop-inspired folding keyboard. Its functionality was basic: you could really only write or take notes on it, but its compact size made it a popular alternative to laptops, which, a decade ago, were far from light. 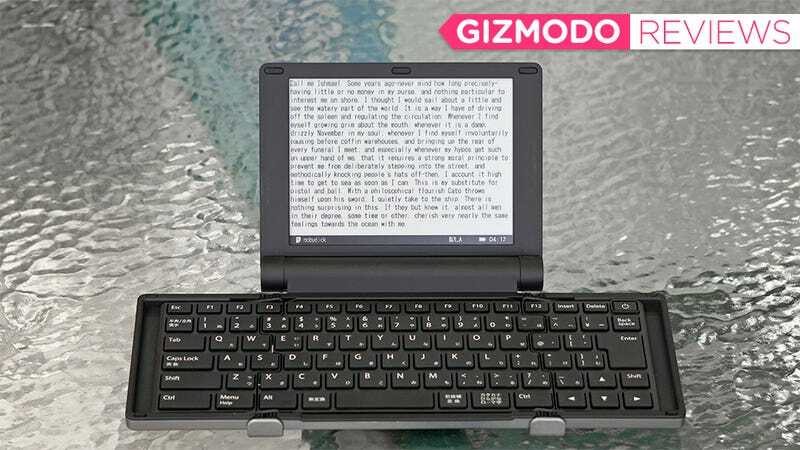 Ten years later, the Pomera DM10 has evolved into the DM30, which now features a larger six-inch e-ink screen, and a more spacious folding keyboard. It’s also the first Pomera that will be made available in North America, but is there still a need for such a device when we now have ultralight laptops and smartphones perpetually in hand? As I check Twitter for the seventh time in ten minutes, I’d say yes. The Pomera DM30 isn’t perfect, the keyboard isn’t quite full-size, but it’s a distraction-free writing tool that procrastinators like myself should seriously consider. It’s not as svelte as a smartphone, but it’s a more convenient everyday carry than a laptop. When folded, the DM30 is a little longer and wider than a smartphone, and at an inch tall, quite a bit thicker. You won’t be carrying it in your pocket, but it’s definitely more bag-friendly than a laptop, and thanks to a generous use of plastics, it’s lighter than most keyboard-equipped machines, including tablets. 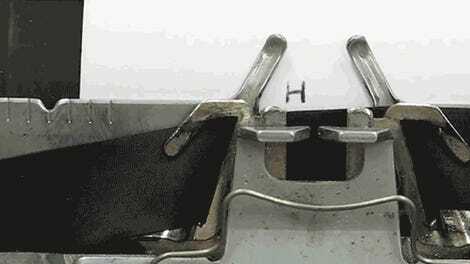 When you open the DM30's keyboard, a small pair of supports automatically fold out. Opening the DM30 is a simple two-step process: first you lift the lid, revealing a six-inch e-ink display, and then you open each side of its keyboard. As you’re unfolding them, a stubby leg automatically extends under each half of the keyboard to support it while you’re typing. It works great on a desk, but I often find myself working with a laptop on my lap (that’s why they’re called laptops, right?) while waiting for flights in an airport lounge, or with my feet up on a desk, and that’s when the DM30's keyboard flexes too much for my liking. I would have preferred a little more rigidity in the keyboard design given the device is being sold as a more portable alternative to a laptop. I can use my MacBook while riding the subway, but the DM30 I can not. The compact DM30 almost manages to muster a full-sized keyboard. I tested the Japanese version of the DM30, which included several mysterious keys I could not translate. But the North American version will use a standard English layout. Every folding keyboard comes with compromises to the typing experience, but the keys on the DM30 surprisingly feel great, with a good amount of travel, and a firm response. The keyboard’s layout also manages to stretch to about 98-percent of the width of my MacBook Pro’s (fading) keyboard, so it didn’t take long for a touch typist like myself to get used to its smaller home row. However, I tested the original version of the DM30, requiring me to tip-toe around the DM30's Japanese-focused keyboard which had some punctuation moved, and additional keys not needed when using the DM30 in its optional English mode. A representative for King Jim has assured me that when the device eventually arrives in North America it will feature a keyboard layout that conforms to the English standard. There’s no mouse, trackpad, or cursor here. Navigating the DM30's UI requires a mastery of cursor keys and keyboard shortcuts. Translation issues aside, the bigger challenge with the Pomera DM30 is having to rely on keyboard shortcuts and the cursor keys for all of your UI navigation. Unlike e-readers such as the Kindle, there’s no touchscreen here, so moving the cursor around, navigating menus, and highlighting text to copy or paste, is all done with the keyboard. It reminded me of using a word processor back in the pre-mouse DOS days—which weren’t fond memories. Older versions of the Pomera used simple LCD displays to help maximize battery life, but the DM30 upgrades to an e-ink screen giving the device about 20 hours of use on a pair of AA batteries, and making it a lot easier on the eyes. There’s no backlight, however, so if you’re trying to get some work done on a red-eye flight, you’ll need to be that jerk who turns on their reading light when everyone else is trying to sleep. Thanks to the limited refresh rate of the DM30's e-ink screen, you’ll occasionally have to endure ghostly outlines under your work until the next time the display fully refreshes. The DM30's default font size strikes a good balance between squeezing a lot of text on screen while keeping things legible, but you can also make it larger, or much, much smaller, to the point where you’ll be squinting your way through a document. One drawback to the DM30's e-ink screen, however, is the limited refresh rate. After highlighting a bunch of text, or jumping through the drop-down menus, you’ll see ghostly outlines beneath your copy for a while, until the entire screen refreshes again. It can be mildly distracting at times, but in no way limits your productivity. The functionality here isn’t going to rival Microsoft Word, but it gets the job done for a rough draft. As word processors go, the Pomera DM30 doesn’t try to compete with the functionality of Microsoft Word or Apple Pages. There’s no spelling or grammar correction, and little to no formatting options. This might change with the English version of the software the DM30 will include when it arrives in North America, but it’s definitely still more of a rough draft device; a place to pound out all the ideas in your head before bringing it into your word processor of choice for edits and final formatting. Files can be stored on the device itself, or on an SD card for easier file transfers. The DM30 can also be connected to a computer as an external drive using a microUSB cable. Without wifi or Bluetooth, getting files from the DM30 to another device isn’t as streamlined as simply bouncing them through the cloud. With docs saved to the device’s internal memory, you can connect it to a laptop with a microUSB cable to manually copy them across. Docs can also be saved to an SD card, which is a little easier to sneaker-net between machines—if you’ve got a memory card reader always on hand. If you want to avoid wires and memory cards altogether, the DM30 can convert your documents into a series of scannable QR codes. But the DM30 has a clever solution to its lack of wireless connectivity. If you don’t want to deal with cables or swapping memory cards, the device can convert a document into a series of QR codes (the number of codes depends on the length of your doc) that can be translated by another device’s camera. Getting a few grafs of raw text from the DM30 onto my iPhone was as easy as snapping a photo of its screen, and copying the text results into the mobile version of Pages. By no stretch of the imagination is the Pomera DM30 a laptop replacement. There’s no email, no browsers, no games, no music, no videos, and definitely no internet. But that’s exactly why it will appeal to some people as an occasional alternative to their primary work machine. It’s a laser-focused writing tool that’s more convenient to carry around than a laptop, and provides an infinitely better typing experience than a tablet’s touchscreen keyboard, or even a cramped keyboard case. The DM30's word-processing software might be basic, but I’ve even found myself procrastinating by stepping through the font choices in Microsoft Word. There’s nothing here to take your mind off a deadline, and that alone could be worth the $300 price tag when this finally arrives in North America later this year. The e-ink screen offers more pros (great readability, excellent battery life, easy to see in bright sunlight) than cons (slow refresh, occasional on-screen artifacts, no backlight for working at night). Zero distractions is a great feature for the easily distracted. Lack of wifi and Bluetooth makes transferring files to a computer more complicated than it needs to be, but the QR code trick is a neat way to avoid resorting to cables. Uses two AA batteries instead of a rechargeable one, so you’ll always want to carry a spare set. The folding keyboard is surprisingly decent and generously-sized, and the Japanese QWERTY layout I struggled with will be replaced with an English layout on the North American version. Not a great laptop alternative if you want to work on your actual lap. The keyboard has a little too much flex. The word processor is basic, so you’ll still need to move your work to a more robust editor for final formatting.